Packing for a week-long vacation or an extended getaway can quickly get out of hand as you try to prepare for all possible situations. It’s better to have something and not need it than to need something and not have it. As you pack and pack without thinking, you don’t realize that you have a space issue until you go to load things into the car. Other times, you may be aware of the limited space in your vehicle and will leave potentially important items behind as a result. Whether you have too much stuff or just not enough space, a roof cargo box for suitcases could be exactly what you need to be able to bring everything you want without overstuffing your vehicle. Very useful for those journeys that involve a trip to the airport! Tightly secured on the roof of your vehicle, cargo boxes enable you to travel with more luggage and save on interior space. Most cargo boxes will fit a majority of cars but as with any popular product, there are a lot to choose from and cargo boxes will vary in terms of durability, size, and safety features so don’t be afraid to shop around before you make your purchase. Why Do You Need a Cargo Box? 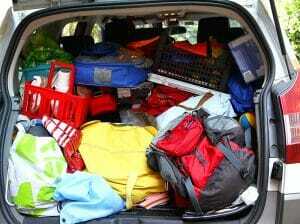 Just because you may be able to fit everything into your car doesn’t mean that you should do it. Cargo boxes are about more than just additional space as they can also help you improve safety and comfort. For example, when you are driving, you want to make sure that you have maximum visibility in all directions but overstuffing your vehicle with suitcases could force you to block your back windshield and potentially some other windows. If you are traveling with multiple people or even pets, you don’t want to crowd the seating areas with luggage either. Long car rides can be uncomfortable in general but if passengers are cramped because of the luggage overflow, it could be a pretty miserable ride. Having a cargo box enables you to safely store excess luggage in an area that is completely out of the way. If you are traveling somewhat light, you can potentially fit everything you have up top but it will also depend on the size of your cargo box. Aerodynamics: Your vehicle itself is designed to be aerodynamic so almost anything you add to it will create some drag. For long-distance traveling, major drag could hurt your vehicle’s performance and reduce your fuel economy. Most cargo boxes come to a point in the front that enables them to cut through the air as you drive to reduce drag as much as possible. Length and Width: Some cargo boxes are wider than others and some are longer than others but both length and width determine how much you will be able to fit in your cargo box. Sometimes width is better, especially for shorter cars, and most cargo boxes will come in several different sizes. It’s just important that you are paying attention to the dimensions so that you don’t purchase something too small or too large. Security: Security includes a few different things and it’s an essential feature that can influence what you do with your cargo box during your trip. First, you want your cargo box to be secured to the car itself. The toughness of the box will often impact how confident you feel, for example, leaving it outside overnight or leaving it exposed during a storm. However, you are also looking for locking systems that secure the cargo box itself. A sophisticated locking system will also give you some greater peace of mind. Price: Of course, you are also looking for a reasonable price and cargo boxes can range from $60 to over $1000. The bag-styled cargo boxes will always be more affordable as well. The best roof cargo box for suitcases will feature all of the best in security, durability, and aerodynamics and that’s what makes it the best. Following are some of the best rooftop cargo boxes that you can buy and all of them will enable you to travel easily, safely, and comfortably for years to come. 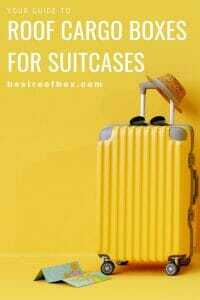 Here’s the facts and figures on our favourite boxes for suitcases. However, you might also want to consider a Roofbag. Yakima Skybox Carbonite 90 x 36 x 20 75lbs Both 16 cu ft.
SportRack Vista XL 19 x 63 x 38 42lbs Rear 18 cu ft.
Thule Force Cargo Box 74 x 36 x 16.5 39lbs Both Sides 16 cu ft.
Thule is a leading manufacturer when it comes to hard-bodied cargo boxes and at least one of their products will likely appear on any list that you come across. Currently a best seller on Amazon, the Thule Motion XT is one of the best cargo boxes that you can buy today. This cargo box excels in almost every category including space efficiency, aerodynamics, and vehicle fit, though some users report a handle that is slightly difficult to use. What sets this cargo box apart from others is that it’s positioned more on the front end of your vehicle, guaranteeing that you will be able to open your trunk fully without interference. There is a pre-installed PowerClick mount system that makes mounting the cargo box easier and the SlideLock system automatically locks the lid in place. There is also a torque indicator that tells you whether or not your cargo box is locked and secured properly, which provides not only security but peace of mind as well. The Motion XT is known for its improved design that maximizes space efficiency and aerodynamics. You will be able to open it from either side of the vehicle and the same as other Thule products, the Motion XT is sleek, slim, and attractive. Another top-rated cargo box is the Yakima Skybox Carbonite, which features a strong latching mechanism and excellent stability along with a lifetime warranty. With the Skybox, you have some peace of mind knowing that your cargo box is secured in place and safe from rough terrain and inclement weather conditions. Similar to the Thule Motion, the Skybox has features that tell you whether or not the box is secured properly and there’s also a satisfying clicking noise that lets you know that you’ve got it in the right spot. This is another spacious cargo box capable of fitting snowboards, skis, and all sorts of other gear, making it an excellent choice for sportier buyers. Of course, this also means that the Yakima will make an excellent roof cargo box for suitcases. With superb space, you can confidently store luggage and suitcases for the entire family. The Yakima comes in multiple sizes that go as high as 21 cubic feet. There is no assembly required for the Yakima Skybox, though some people have reported a less-than-easy mounting system. The difficulty you have may depend on the type of car that you drive. Once it’s up there, however, you shouldn’t have to worry about it for the entire ride and the aerodynamic design ensures that you maintain fuel efficiency. With the ability to fit a variety of factor racks, the SportRack Vista is relatively easy to mount and you will also find it at a more affordable price than other cargo boxes. With a durable, UV-resistant outer shell, your belongings are safe and secure inside of the cargo box and the U-bolt hardware mounting kit ensures that your cargo box isn’t going anywhere during travel. Many would consider this a “basic” cargo box due to its lower price, basic design, and simplicity but that doesn’t make it any less effective. One of the biggest struggles of cargo boxes is buying something that doesn’t easily attach to your car but with a high compatibility rating, you should not have too many problems. Compared to other boxes, the Vista XL is relatively lightweight and easy to mount. With a reliable locking system, you can rest assured that your belongings are safe. Keep in mind that the Vista has a rear opening as opposed to an opening on the sides; depending on your preference, this may be easier for you. The quick release mechanism is convenient when it comes to unloading your belongings so if you are looking for an affordable but effective cargo box option, this could be the one for you. Not all cargo boxes are hardtops and sometimes the soft-top carriers are just as effective if not more so. With soft-top carriers, there is perhaps more room for error so make sure that you are buying a good one. The RoofBag carrier, for example, is an excellently rated rooftop cargo box that offers a slightly different experience. One of the best parts of this soft-top carrier, in particular, is that it’s designed to sit on the bare roof of the vehicle, meaning that you don’t need to purchase any racks to make it work. It’s extremely versatile while offering excellent protection for your belongings. With two different sizes available, you can still fit several suitcases and you have a storage capacity of 3000 pounds. Even though it’s a bag and not a hard shell, the RoofBag is known for being durable and waterproof. Even the straps are very strong so it’s just as reliable as having a hard-shell case. Perhaps the only downside to this product is that you are supposed to place a mat underneath but the mat is sold separately. The good news is that the RoofBag is far more affordable than almost any other cargo box so you will be able to buy both the bag and the mat for less than you would pay for another product listed here. If you think that a Roof Bag might be for you be sure to check out our Soft Roof Cargo Box Buyers Guide. The Thule Force is another Thule-manufactured cargo box that you couldn’t go wrong with. This high-performance cargo box is strong and space efficient with an optimized design for aerodynamics. Its ability to cut through the air ensures that you don’t waste gas during travel and while it’s slim, there is still plenty of room for bags and belongings. The versatile mounting design ensures that you are able to attach it to your vehicle without a Thule rack system. With a tool-free, quick mounting process, you can mount it and load with speed. The simplicity of this mounting process makes it perfect for people who will be mounting and unmounting it frequently. The Thule Force comes in five different sizes so you can enjoy the excellence of the product whether you drive a small vehicle or a large one. Unlike the Thule Motion, however, there isn’t really an indicator that tells you when the cargo box has been properly mounted but there are locks on both sides of the box for extra security and peace of mind. You should have no problems taking this through rough terrain or harsh weather and it’s sealed enough that all of your belongings are safe regardless of the outdoor conditions. How much space do you need? How would you prefer to access your cargo box? Do you prefer the hard case or would you be okay with a soft bag? How long is your vehicle compared to the box you are looking at? Having a roof cargo box for suitcases will be extremely useful but you want to make sure that you buy a box that is appropriate for your vehicle and suits your needs perfectly. You will also want to consider the height of your garage door and whether or not you have space to store the cargo box when you aren’t using it. The bags might be easier to store..